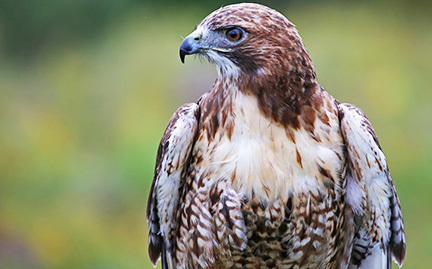 Red-tailed-Hawks are the most common hawks in North America. Designed for soaring, their broad, rounded wings help them effortlessly glide high over fields in open country. Red-tail populations are greater in winter when northern birds migrate to join the sedentary population. They perch high above the ground to hunt, swooping down to capture prey in their talons.